Description: another rainy shot. This time it's blurry. 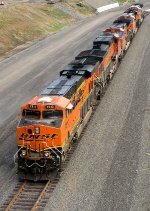 Q393 heads west with 8 BNSF's! Description: Crossing the diamond with the Prosper sub @ Moorhead JCT. Description: BNSF 6662 waits for BNSF 5444 West to clear the crossovers at West Winslow. Traffic often diverts to left-hand running east of Winslow, owing to prevailing gradients. Description: BNSF 6662 drifts down to the West Winslow signals as BNSF 5444 West leaves town. Title: BNSF 7813 trying low light time. Description: While in Aurora, this BNSF stack train came through. Title: BNSF 7813 Leads hot shot Z train at first light! Description: WB stack/z train rips toward La Plata Mo. Title: 4 unit's work a WB stack into La Plata Mo. Description: BNSF 7813 coasts into Brashear, Mo. with a big stack train on the BNSF Marceline Sub. Title: BNSF 7813 Leads a WB stack in golden light. 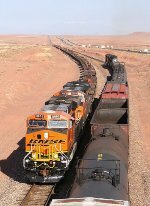 Description: WB Bnsf stacks drift down hill from Hurdland Mo. Description: BNSF 7813 leads this east bound stacker as it breezes under the old ATSF signal bridge in Bucklin, Missouri on the BNSF Marceline Sub. This old bridge is just one of the few relics from the former ATSF mainline to survive during the recent tear downs. Only time will tell on its future and fate. Title: BNSF 7813 Blow's east under the Santa Fe signal bridge. Description: BNSF 7813 - BNSF 4932 - BNSF 4779 - BNSF 7892 - BNSF 4899 top-line view on the turn-table siding behind the service area, south side of the 39th Street over-pass. Description: BNSF 7813 closest to the over-pass and turn-table on a power-slot of five units under hazy skies.